Setting world-class standards in pharmaceutical packaging! 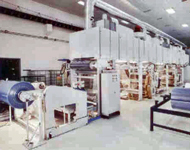 We have state-of-the-art comprhensive manufacturing facility comprising of equipment for calendaring, coating, lamination, slitting & sheet cutting under one roof which gives us complete control over the process and enables us to assurer comprehnsive traceability. This facility has Class 100000 (ISO8) manufacturing conditions in Coating & Slitting and complies with cGMP norms. European Pharmacopeia and with Directive 2002/72/EC and amendments in their current version. US Code of Federal Regulations CFR21 and with the US Pharmacopeia where applicable. Directive 94/62/EC with US CONEG Regulations. US FDA, DMF 15884, Type III. PLC Based, auto dosing system controls qualitative parameters of the batch. Integration of auto dosing and SAP system enables traceability of individual components upto raw material batch no. Films tested for comformance to customer specified requirements at all stages of manufacturing in our in-house, state of the art quality lab. Continual improvement in quality achieved through statistical QA system, including problem cause analysis as well as corrective and preventive action plans in our operations. CAMERA INSPECTION SYSTEMS are deployed on the calenders and slitting machines before final packing. Highly qualified professionals with relevant experience lead ACG Pharmapack's Innovation team. The team includes polymer and process technology experts. SOLUTIONS THAT PACK A PUNCH!